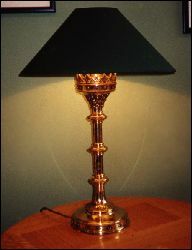 An adapted gothic revival candlestick based on the designs of A.W.N.Pugin and wired for use as a table lamp. The transition from large-scale architecture to intricate works in metal is a difficult one for any designer. Few have been able to achieve as much success in this change of scale as A.W.N.Pugin. In many ways the gothic style with its reliance on architectural forms is an ideal one for metalwork. Pugin did not invent gothic objects to fill a gap but concentrated on designing the kind of vessel or lighting that would fit naturally into what he considered a gothic interior. Augustus Welby Northmore Pugin was the most influential designer in nineteenth-century Britain. As an architect of cathedrals, parish churches, schools, colleges and private houses, and in particular as one of the two designers of the Houses of Parliament, The Palace of Westminster, Pugin did more to make Gothic Revival the national style in Britain, as well as other parts of the world.